If you’re looking to put together a simple makeup kit for both everyday looks and night-out glam, it can be overwhelming with the aisles and aisles of various products in a rainbow of colors. 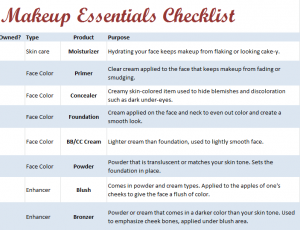 The Makeup Essentials Checklist details the different types of basic makeup along with their purpose, and includes beginner tools to help with application. Using the link below, download the Excel spreadsheet and open it. The checklist is divided into four columns: One for checking off if you own the item, the type of makeup it is, what the product is called, and finally the purpose of the product. The type column describes what each makeup item covers. The purpose portion gives an overview of the usage of the item and what it does for the wearer. There are also brushes and tools that explain application. Though the items are considered essentials, anyone can skip something if, for example, they prefer to go without foundation because they have a very even skin tone. It may be tempting to accept used or older makeup from friends, but increases your risk of infection as old and used makeup can carry bacteria. Watch online tutorials to learn how to apply each product properly. Not all products need to be worn at once, but it’s good to see how certain looks come together. Start with cheaper brands if you’re a makeup beginner. Decide what you want to splurge on after you know what items you care about most. Always use foundation/BB cream with SPF in it. Plain makeup is no protection from the sun. Wash your brushes frequently as they can attract bacteria. Keep your makeup in a kit or basket. Eye shadows and other powder products can easily crack from movement so make sure they are secure. For eye shadows, start with a pallet of neutral colors. This will help you learn how to blend before moving onto lime green. If your skin reacts badly to any makeup, stop using it immediately and examine the ingredients to find what caused the reaction.